420. The 420th Champion Stamp Co. Champion Stamp Co..
Vi har tidigare skrivit om n�gra av v�ra fritidsintressen h�r p� Ett annat New York, och i dagens inl�gg har det blivit dags f�r ytterligare ett tips r�rande en syssla som h�lften av redaktionen pysslar med p� sin lediga tid, n�mligen frim�rkssamlande. We have previously written about some of our hobbies here at Another New York, and in today's post, it's time for another question regarding a chore that half the editors were doing in their free time, namely stamp collecting. Denna hobby har jag �gnat mig �t sedan barnsben, och min fr�msta inriktning �r n�got som kallas f�rstadagsbrev , vilket �r specialdesignade brev d�r frim�rket �r st�mplat p� utgivningsdatumet. This hobby, I have dedicated myself to since childhood, and my primary focus is on something called the first-day covers, which are specially designed letter with the stamp is stamped on the issue date. D�rf�r beger vi oss nu ned till Midtown och Champion Stamp Co. Therefore, we head now down to Midtown and the Champion Stamp Co..
Champion Stamp Co. Champion Stamp Co.. �r New Yorks st�rsta frim�rksbutik, och de har sedan �ppnandet 1992 varit en sj�lvklar destination f�r stadens all filatelister. 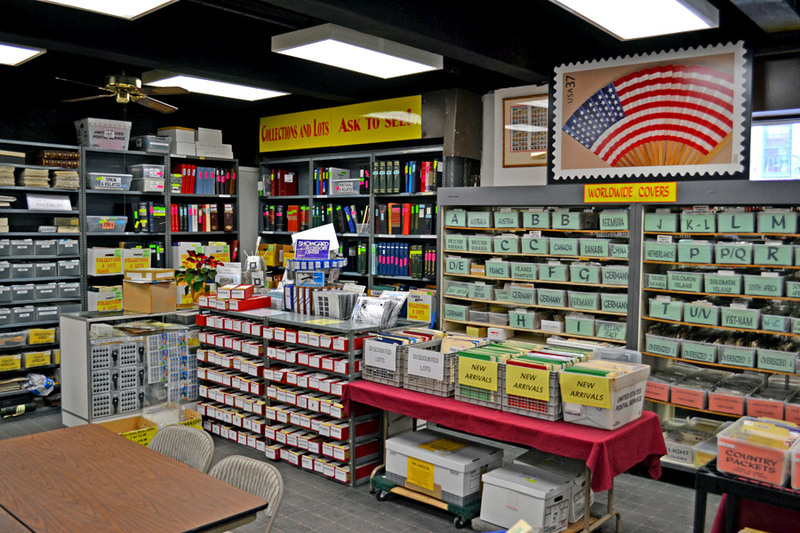 New York's largest frim�rksbutik, and they have since opening in 1992 was an obvious destination for the city all philatelists. Butiken �r enorm, och de har dessutom ett exklusivt showroom d�r de riktiga dyrgriparna f�rvaras. The store is huge, and they have an exclusive showroom where the real treasures are kept. Frim�rken fr�n v�rldens alla h�rn st�r att finna i utbudet, och �r du dessutom intresserad av aktiebrev och sedlar b�r du avs�tta minst ett par timmar f�r ett bes�k. 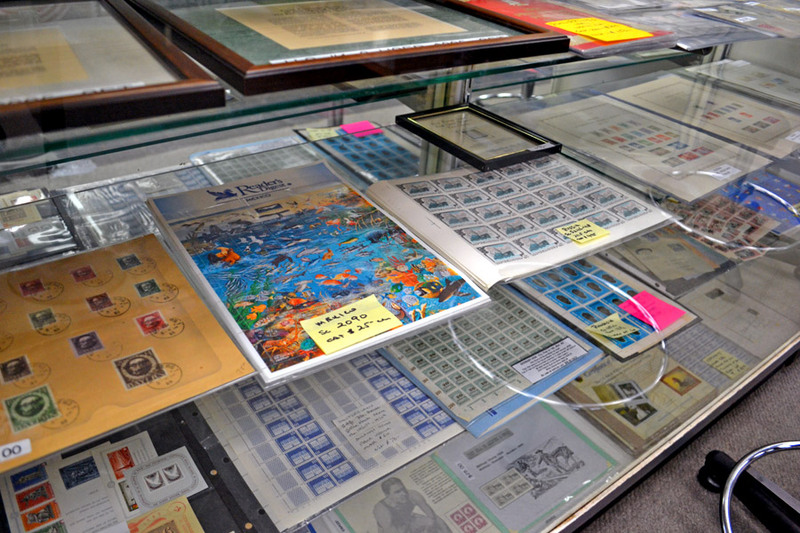 Stamps from around the world lies in the range, and you are also interested in the stock certificates and bank notes, you should devote at least a few hours for a visit. Som n�mnt �r jag sj�lv en h�ngiven samlare av f�rstadagsbrev, fr�mst med inriktning p� rymdprogram samt de olympiska spelen. As mentioned, I'm also an avid collector of first-day covers, concentrating primarily on the space program and the Olympic Games. Champion Stamp har ett enormt utbud av fina f�rstadagsbrev, v�l sorterade efter geografiskt ursprung och utgivnings�r, vilket g�r letandet efter dyrgripar till ett rent n�je. Champion Stamp has a huge selection of fine first-day covers, well sorted by geographical origin and year of publication, making the search for treasures into pure pleasure. Ett av mina senaste fynd var ett brev fr�n 1974 till minne av det h�rliga rymdlaboratoriet Skylab , d�r grafiken i sig �r en anledning att dr�mma sig n�gra �rtionden bak�t i tiden. 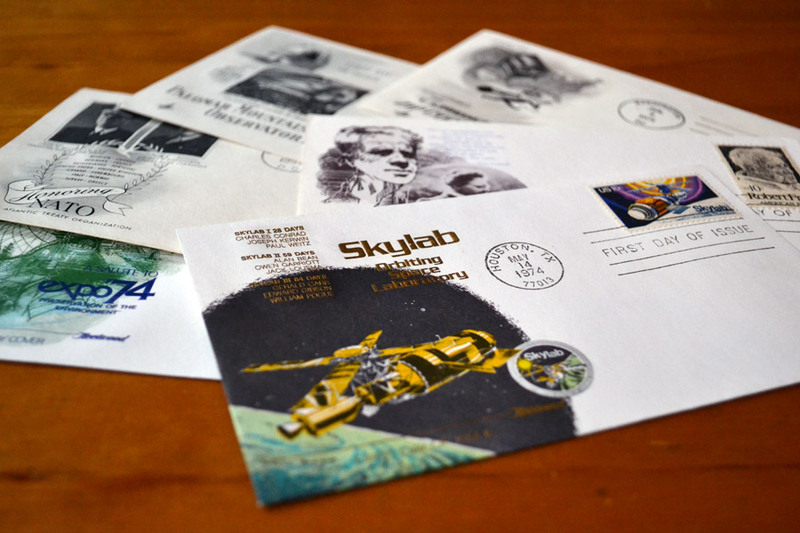 One of my recent discoveries was a letter from 1974 in memory of the glorious space laboratory Skylab, where the graphics is in itself a reason to dream a few decades back in time. 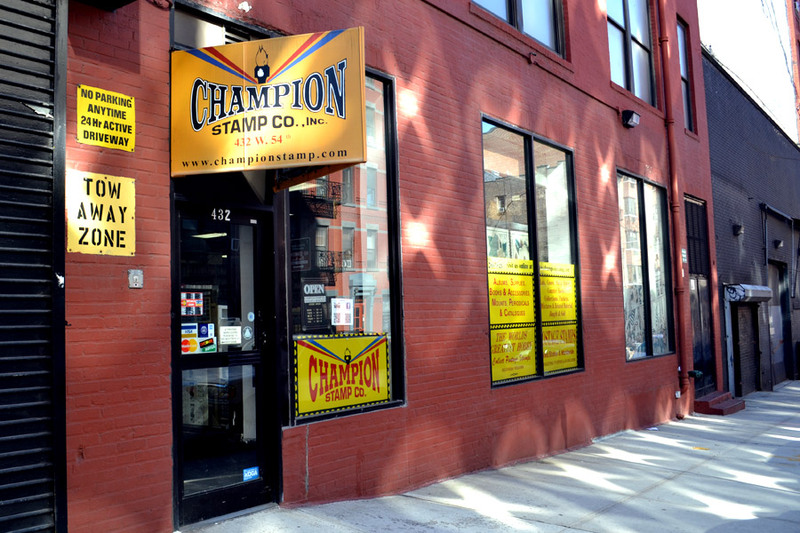 Champion Stamp Co. Champion Stamp Co..